Today, the diet of children have gone from basically fresh whole food to over-processed, grease-soaked, chemical-driven, sugar and salt-filled and nutritionally questionable dietary choices. Coupled with a sedentary lifestyle, your precious kids are bow facing a whole new set of lifestyle and diet-related diseases such as diabetes, obesity, high blood pressure and heart disease, all unrelated to germs. You need to inculcate healthy eating habits and lifestyle to your kids during their formative years, as diseases develop, it doesn’t start overnight. Prevention is about taking steps while your kids are healthy and not until they are faced with a crisis. Health is like money, we will never have a true idea of its value until we lose it. 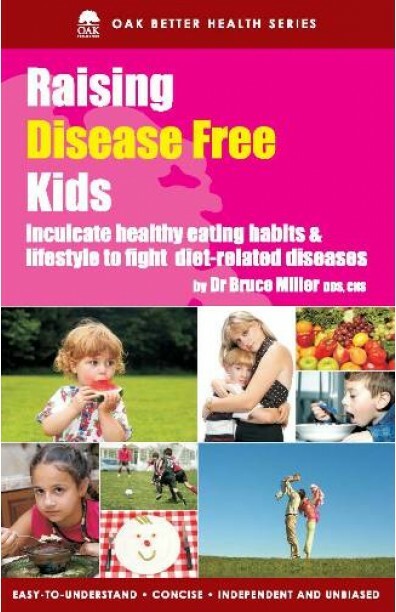 In easy to understand language, this book addresses the need for parents to make changes to their children’s lifestyle and diet while they are young in order to fight diet related diseases; if you want to raise disease free kids. ABOUT THE AUTHOR Dr. Bruce Miller’s postgraduate studies at New York University included clinical, nutrition oriented research which focused on nutrition problems of the elderly. Dr. Miller is a member of the Linus Pauling Institute of Science Medicine, a charter member of Dr. Kenneth Cooper’s Aerobics Center, a member of the International Academy of Preventive Medicine, International College of Applied Nutrition, founder of the Diet Analysis Centre, and a consultant to the American Running and Fitness Association. Dr. Miller is a Certified Nutrition Specialist and a member of the American College of Nutrition. Currently Dr. Miller is the Director of Research for the American Academy of Nutrition. Dr. Miller lives in Dallas with Jody, his wife of more than 40 years.